The arrest of Donald Trump's campaign manager Corey Lewandowski Tuesday capped three weeks of allegations between the campaign and former Breitbart reporter Michelle Fields. Fields claimed that Lewandowski yanked her away from Trump so violently that he left fingerprints on her arm. Trump's campaign denied that ever happened. "Trump always surrounds himself w thugs. Tonight thug Corey Lewandowski tried to pull my gf @MichelleFields to ground when she asked tough q"
March 9: the Trump campaign did not respond to requests to comment about the allegation. "I never sought to be part of the story." After the press conference, "I asked him about his view on an aspect of affirmative action. Trump acknowledged the question, but before he could answer I was jolted backwards. Someone had grabbed me tightly by the arm and yanked me down. I almost fell to the ground, but was able to maintain my balance. Nonetheless, I was shaken. The Washington Post's Ben Terris immediately remarked that it was Trump's campaign manager, Corey Lewandowski, who aggressively tried to pull me to the ground." This person claims she does not want to be part of the news, and only report it, however if that was the case, any concerns, however unfounded they may be, should have been voiced directed first and not via Twitter, especially since no other outlet or reporter witnessed or questioned anything that transpired that evening. We leave to others whether this is part of a larger pattern of exaggerating incidents, but on multiple occasions she has become part of the news story as opposed to reporting it. Recall she also claimed to have been beaten by a New York City Police officer with a baton." "I watched as a man with short-cropped hair and a suit grabbed her arm and yanked her out of the way. He was Corey Lewandowski, Trump's 41-year-old campaign manager. Fields stumbled. Finger-shaped bruises formed on her arm. 'I'm just a little spooked,' she said, a tear streaming down her face. 'No one has grabbed me like that before.'" "Trump's campaign claims there were no witnesses. Here is a report from @bterris of the @washingtonpost. He saw it"
"Michelle Fields is an attention seeker who once claimed Allen West groped her but later went silent." "Well, I heard that nothing happened. You know we're surrounded by Secret Service and when they left; you all set? We're surrounded by Secret Service, many Secret Service, you see some of them here; when we left, I spoke to them, nothing happened. This was, in my opinion, made up. Now I didn't see anything, all of a sudden we heard about it later on. But, the Secret Service nothing happened... The Secret Service are amazing people, they said absolutely nothing happened. He didn't hear about it until like the next day. So, and I wasn't involved in it but the Secret Service was surrounding every body, they said nothing happened, everybody said nothing happened, perhaps she made the story up, I think that's what happened, okay." "You are totally delusional. I never touched you. As a matter of fact, I have never even met you." March 11, mid-morning, Fields reaches out to the Jupiter Police Department. The department confirms that it is "investigating an alleged battery." "The accusation, which has only been made in the media and never addressed directly with the campaign, is entirely false. As one of the dozens of individuals present as Mr. Trump exited the press conference, I did not witness any encounter. In addition to our staff, which had no knowledge of said situation, not a single camera or reporter of more than 100 in attendance captured the alleged incident. This individual has never met Corey, nor has the only reporter that supposedly identified him." March 29, Jupiter Police Department issued an arrest report. 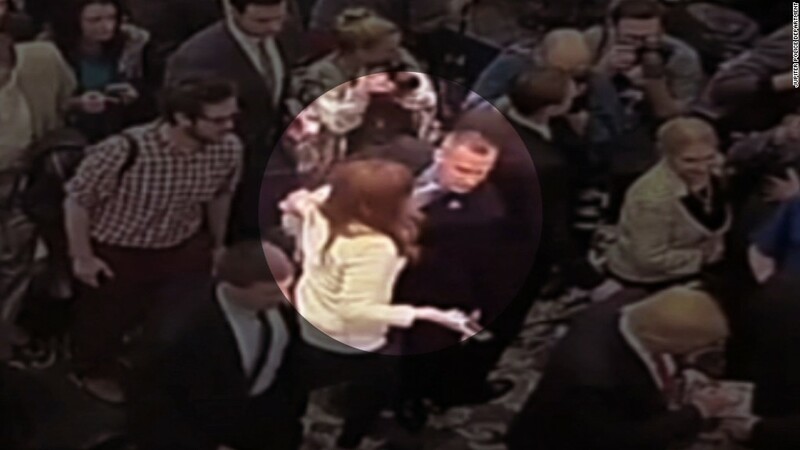 The police report said its investigation determined that "probable cause exists to charge Corey Lewandowski... with (1) count of simple battery... in that he did intentionally touch Michelle Fields... against the will of Michelle Fields." March 29, Trump campaign spokeswoman Hope Hicks says Lewandowski is "absolutely innocent." "He will enter a plea of not guilty and looks forward to his day in court. He is completely confident that he will be exonerated," according to the statement.